Tunnelling has begun on Singapore PUB’s $10bn, Deep Tunnel Sewerage System (DTSS) Phase 2 project following the launch ceremony of the project’s first TBM, officiated by Minister for the Environment and Water Resources, Mr Masagos Zulkifli. This first TBM, to be used on Contract T-07 and named after the Jalan Bahar work site where it will be lowered into a shaft, will create a 3.5m-diameter tunnel 42m below ground. A total of 19 TBMs will be used for this project, to dig at depths of between 35m and 55m below ground and seabed, to create the 40km of deep tunnels and 60km of link sewers that range from 3m to 6m in diameter. DTSS Phase 2 deep tunnels will be a showcase of cutting edge technologies and advanced smart sensors at work. Constructed using concrete resistant to microbiological-influenced corrosion and lined with High Density Polyethylene (HDPE) to further protect the concrete from the harmful sewer environment, the tunnel will also come equipped with a waterproof membrane coating in sections where it goes under the seabed. During tunnelling, PUB will employ a smart tunnel monitoring system known as the ‘Shaft and Tunnel Excavation System’ (STEMS) to act as the nerve center to provide real-time updates of the TBM locations and instrumentation readings. Fibre optic sensors are embedded within the tunnel lining, to monitor structural integrity and detecting problems before they become potential risks. The installation of isolation gates at strategic points of the deep tunnel allow for sections of the tunnel to be isolated in the event where used water flow diversion is required. To mitigate odour, forced ventilation equipment called “air jumpers” will also be used in the operations of its air management system in the tunnels, a first for Singapore. The DTSS Phase 2 conveyance system will traverse 100km across the western half of the island, including the downtown area as well as upcoming developments such as the Jurong Lake District, Tengah Town and the Greater Southern Waterfront. Works on the system will be carried out through 18 contracts, including 5 design and build contracts (see below) for the deep tunnel that runs along the Ayer Rajah Expressway from Keppel Road to Tuas View Basin, and another 13 contracts for the link sewers. Tunnelling works is targeted to complete by 2024. 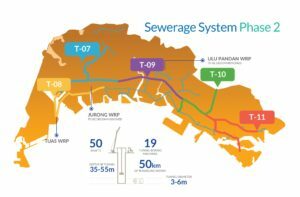 When completed, used water from homes, offices and industries will be conveyed via two tunnels – the 30km-long South Tunnel (domestic use) and the 10km Industrial Tunnel (industrial use) – to the Tuas Nexus for treatment and recycling into NEWater. Consists of a 6m diameter tunnel for domestic used water, which under-crosses the sea with the longest drive at about 2km. It is also the only contract featuring an industrial used water tunnel about of 3.3m and 4m diameter along Pioneer Road. The only contract that has one common size Tunnel Boring Machines (TBM) (6m diameter) throughout its entire length and runs along the Ayer Rajah Expressway. The only contract which uses the Earth Pressure Balance type TBM (the West Coast TBM) while all others utilise slurry TBMs. It comprises TBMs of 3.5m, 4m and 6m in diameter that runs mainly along Clementi Road, Farrer Road and Ayer Rajah Expressway respectively. It also features the deepest shaft across all contracts measuring 66m deep. Marks the starting point of the tunnels and therefore, the shallowest under DTSS Phase 2. It runs mainly along Keppel Road and Telok Blangah Road. It features the most number of TBMs and shafts of varying diameters, including an under sea crossing T-11 comprises TBMs of 3m and 3.3m in diameter, the smallest TBM used in DTSS Phase 2.